Please remember these Santa Anna folks that are serving our country in combat, training, or support: Brandon Beloat, James Culpepper, Eddie Dawson, Kristle Deleon, Glen Donham, Reuben Frausto, Misti Graves, Bobby Hale, Patrick Kerr, Heather LaChance, Truman Matthews, Jeff Rivera, Josh Rivera, Michael Ruth, Marty Siller, Allen Tucker, Lance Vasquez, Austin Voss, Scott Watson, and Shane Watson. Special thanks to Montie Guthrie for helping me out with this list. 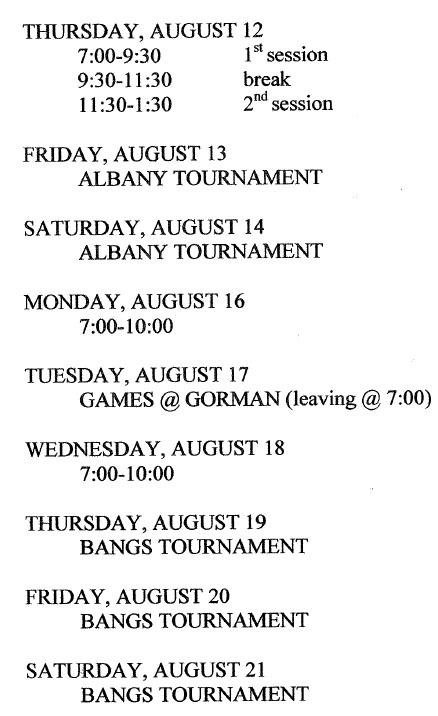 I know it doesn't seem like it, but football practice starts on Monday August 2nd and school just three short weeks after that on August 23rd. Homecoming is early this year, September 24th, so you better get started on your Homecoming plans... because that is less than two months away! The Mountaineers are picked last in their district by Dave Campbell's Texas High School Football magazine so it might be a long season... but what does Dave know about football? Besides I don't think he knows much about six-man football... I think Granger Huntress of sixmanfootball.com does the six man section anyhow... and what does he know? ...pretty much everything! I am hoping that Coach Eubank learned alot of new six man tricks over the Summer and can mix them up with some old eleven man tricks and come out with a few wins this year. Our district only has four teams, Zephyr, Blanket, and May so that means only three district games. A couple of months ago, my bosses wanted me to look into teaching a class on social networking so I signed up for a work Twitter, Myspace, and Facebook to learn about it first... kind of hard to teach about it if you've never done it! I have come to a conclusion that it won't last... mostly because they fast rise in popularity and the new wears off pretty quickly. A fad? Yes, but it is addicting. The average Facebooker uses Facebook five hours per week which is two years in a lifetime. No worse than watching TV I guess... at least you are communicating with others when Facebooking. I think I watch more than five hours of TV a week... I think I may have watched more than five hours of Texas Rangers baseball this last week. No I am not a big fan and I probably haven't watched that much Rangers baseball in the last five years put together, other than at live games. I tell people all the time don't say anything on the Internet, a web site or, email that you wouldn't tell your mom, wife, boss, teacher, or preacher... and after this week I have to add doctor to that too because one of my Facebook Friends, Dr. Reynolds, got on to me for eating a Country Basket at Dairy Queen! I haven't had much news lately so I thought I would send July out with a little ramble, and I almost forgot to tell you about my inch or so of rain the last several days! Have a good weekend and we will see you next week! Santa Anna, TX: A summer family event called “Egypt” will be hosted at the Seventh-Day Adventist Church (142 CR 106, Santa Anna, TX 76878) from August 2nd, 2010 thru’ August 6th, 2010. Families will step back in time at “Egypt”, exploring the life of Joseph. Kids and adults participate in a memorable Bible-times marketplace, sing catchy songs, play teamwork-building games, dig into Egyptian eats, visit Joseph in prison and then in his palace home, and collect Bible Memory Makers to remind them of God’s Word. Plus, everyone learns to look for evidence of God all around them through “God Sightings”. Each day concludes at Celebration—a time of upbeat worship that gets everyone involved. Kids and adults at Egypt will join nearly a million participants blanketing Africa with God’s love through a hands-on mission project in association with an organization called “Operation Kid-to-Kid”. With “Operation Kid-to-Kid”, families will create soft blankets that will be sent to orphans and vulnerable children. Egypt will run from 6:30 PM to 9:00 PM each day. On Saturday morning from 11 AM - !2 Noon the children will be presenting a special Kids Program for their families with a luncheon following the program from 12 Noon to 2 PM. For more information, see Posters around town, online news sites: http://www.colemannews.com/ & http://www.santaannanews.com/ , or call Janet at 325-348-6024 to leave your question & phone contact information. THE DESCENDENTS OF I. E. AND REBA D. HARTMAN GATHERED AT THE MC ELEGATE’ SUITES IN ABILENE ON SATURDAY, JULY 17, 2010 FOR THEIR ANNUAL REUNION. ALL THREE OF THE SURVIVING CHILDREN WERE IN ATTENDANCE: EDD HARTMAN OF SANTA ANNA, WINNIE BLANSCETT OF MIDLAND, AND JONIE HARTMAN OF ODESSA. THOSE IN ATTENDANCE ENJOYED A DAY OF VISITING, PICTURE TAKING, GAMES AND THE “WHITE ELEPHANT” AUCTION. THE GROUP ALSO DECIDED TO GIVE $200.00 TO THE SANTA ANNA CEMETERY ASSOC. LATER, EVERYONE ENJOYED A WONDERFUL EVENING MEAL AT BELLE’S CHICKEN HOUSE RESTRAUANT. SEVERAL IN ATTENDANCE WON DOOR PRIZES OF EITHER POTTED PLANTS OR GIFT CERTIFICATES. The supply of type O negative blood at United Blood Services has dropped to critically low levels. Type O negative blood is always in high demand because it can be transfused to patients with any blood type, especially in emergency situations. Type O negative donors are needed now to help prevent the type O negative blood supply from declining further. United Blood Services is reaching out to eligible blood donors, sponsors and community leaders to ask them to help recruit type O negative blood donations to help make up for this shortfall. While all blood types are needed during the summer months, we urge those eligible donors with O negative blood type to make and keep appointments to give blood in the upcoming days to help restore the inventory level. United Blood Services monitors the blood inventory on a daily basis and when we see a trend or shortage emerging, we communicate the need to our generous blood donors to help us make up the shortfall. A shortage of type O negative blood often occurs during the summer months when fewer donors are giving because of summer vacations and schools are on summer break and not hosting blood drives. Every two seconds, someone in the United States needs blood. United Blood Services provides lifesaving blood to 10 hospitals and must have 50 people give blood and platelets each weekday to meet hospital demand. Accident victims as well as patients with cancer, sickle cell disease, blood disorders and other illnesses receive lifesaving transfusions every day. There is no substitute for blood and volunteer donors are the only source. If you are 16 years of age meet weight and height requirements (110 pounds or more, depending on their height) and are in generally good health you may be eligible to give blood. You must your have your United Blood Services blood donor card or other form of positive ID when you come to donate. Lost your dog? Two nice dogs appeared at my home SE of Santa Anna. One appears to be a pointer and the other a pitbull. If you think they are yours please call 348-3244. 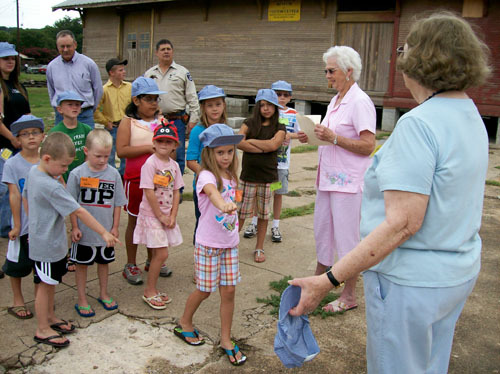 On Thursday, July 1st, Director of the Santa Anna Library, Alice Spillman led 13 young minds to the old train depot warehouse and future home of the Santa Anna Museum and Visitor’s Center for an instructional look into the past. 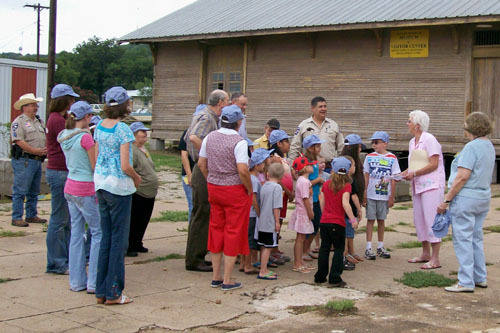 Santa Anna Economic Development Board member and city employee, Wanda Campbell presented the children with the history of the depot as well as its significance. Campbell also showed the children pictures of the depot in its hay-day when it stood next to the train tracks and served as the community’s foremost hub and artery of transportation. The youths were clad in the standard blue and white pin striped conductor’s caps provided to them by the Santa Anna Library. Also present, were BNSF Railroad Engineer Mark Sanderson, Police Chief, Carlos Torres and Officer Rick Hochmann, library volunteers Tex Wright, Betty Key, Karen Redmon, Delaynee Absher, Alexandria Simpson, Loren Pritchard, Micah Pritchard Courtlyn Lishka and James Spillman. Those minding the library and not present for presentation were Yvonne Halmon, Pat Wright, Carol Herring and Judy Stephens. Afterwards, the group convoyed to the railroad tracks to inspect the first home of the depot and where they were met by area railroad workers who showed and described a piece of equipment utilized by the railroads. The presentation is part of a state reading program given each summer by local libraries catering to young people from 4 years of age to the 5th grade. This years reading club theme is ironically entitled “Catch The Reading Express” with all books read being about trains. The reading club met each Thursday from 10 to 11:30 a.m., beginning on June 17th and will reach completion on July 8th. Once each child completes the program, he or she is awarded a free book, a chance at tickets to the Railroad Museum in Brownwood, and for the reader who has read the most books in each age group, a type of toy train. The groups not only read, but were able to engage in activities that included games, coloring trains or building rail cars. 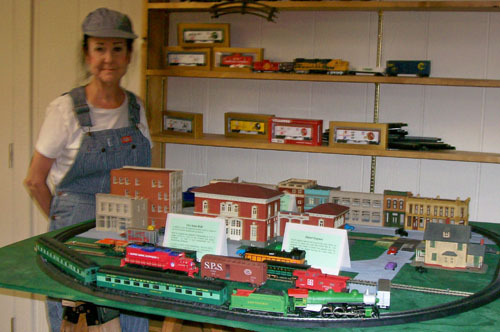 To help with the program, residents Russ Fisher and Tex Wright added a bit of flavor to this years program by constructing and placing in the library a community with a miniature electric train set. The replica was operated by Engineer, Pat Wright and with Conductor, De Anna Smetak. Descendants of Sam and Nola Moore, who lived in the Cleveland community for most of their lives, held their annual reunion recently in Llano. Forty people attended, including two of the Moore’s surviving three daughters. Ruby (Moore) Hartman, of Santa Anna, eldest of the three sisters, attended. She was joined by several of her children and their husbands and wives. Helen (Moore) Hawthorn, of Crane, was there along with several of her offspring and sons-in-law and grandchildren. The third sister, Doris (Moore) Penny is seriously ill in Longview and could not attend. Joining in the festivities were Richard and Jay Hodges, of Brownwood. Richard is the grandson of Sam Moore’s late twin sister, Sallie (Moore) Hodges. Sallie and her husband, Passie, were longtime residents of Rockwood. Guests enjoyed a midday lunch of fried chicken and all the trimmings, plus homemade desserts made by attendees. A feature of the event was a trash to treasure auction of various merchandise donated by family members. The auction raised almost $2,000, which is used to offset expenses incurred to stage the event. The Moore family also made a donation to the Santa Anna Cemetery Association. One of my favorite shows, ABC's Extreme Makeover Home Edition, may soon be coming to Coleman County as the Marsden Family of Glen Cove is up for consideration. Read their stories at ColemanNews.com and this Abilene Reporter News Article. The family has also started their own website www.extremehome4jade.webs.com. June went out wet with over three inches of rain the last several days of June and still raining. 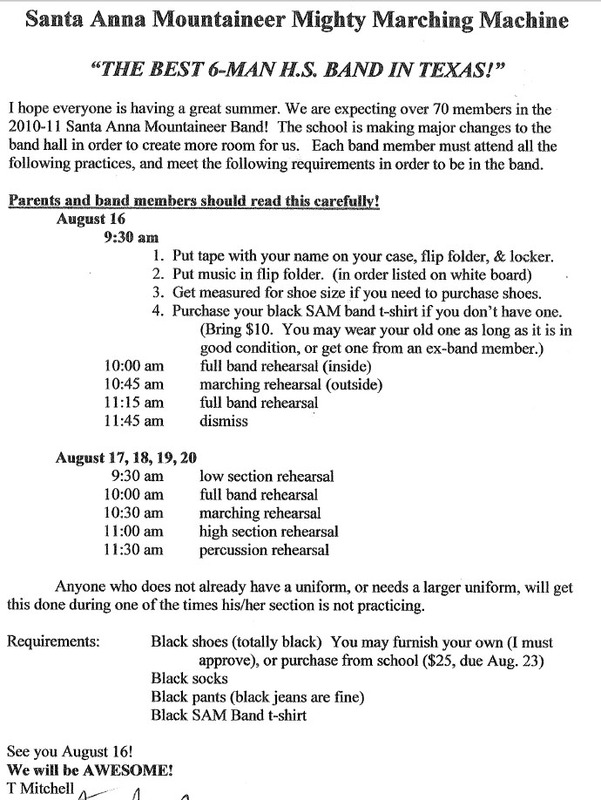 According to school officials the 2010 SAHS Homecoming will be September 24th Vs. Eden. Start planning those reunions and get togethers today! United Blood Services continues its Urgent Appeal for Type O Negative blood. The approaching 4th of July holiday is all about our heroes. Find the Hero in you -- Donate blood TODAY! Donors have 3 days to donate blood to save the lives of patients over the long July 4th Holiday. Blood is held in quarantine for 24 hours after it is donated so that extensive testing for 11 diseases can be completed to ensure it is safe to be transfused! The requirements for donating are simple: You must be at least 16 years of age, weigh at least 110 pounds, and be in good health. It takes about an hour – but your hour of time can mean a lifetime of hours for the patient who needs your lifesaving blood! To schedule an appointment or find a mobile blood drive near you, go to www.bloodhero.com or call us at 325-223-7500 or toll free at 1-800-756-0024. United Blood Services has been this area’s non-profit community blood provider since 1953, and serves patients in 10 hospitals in 11 counties. The United Blood Services network is one of the nation’s oldest and largest non-profit blood service organizations, and is a founding member of America’s Blood Centers and the AABB.